I had two birthday parties in my life. Two. Not that I especially cared that much. Birthday parties weren't a "thing" then. Sometimes kids had them; mostly they didn't. We weren't exactly the center of the universe. I don't know why my mom decided I should have one when I turned five. I was too young to have actual friends. I had cousins and neighbors. I really only liked one of my cousins, and my neighbors I knew as much as one could know fellow school bus riders. In the country we didn't have "next door neighbors". We had neighbors whose houses we drove past on the country road on the way home. But I guess they were the same age as me, so voila! Another aspect of birthday parties was that we all (most of us) wore dresses. It wasn't a big deal -- we had to wear dresses to school, so it's not as if we dressed up in our birthday party finest. Half the kids at my party lived in town, so there was a lot of whining when we went outside to do things that involved "nature". Actual open air was "icky" to some...grass and mud (!) and non-paved walks. I wonder if these girls ever managed to maneuver through life. 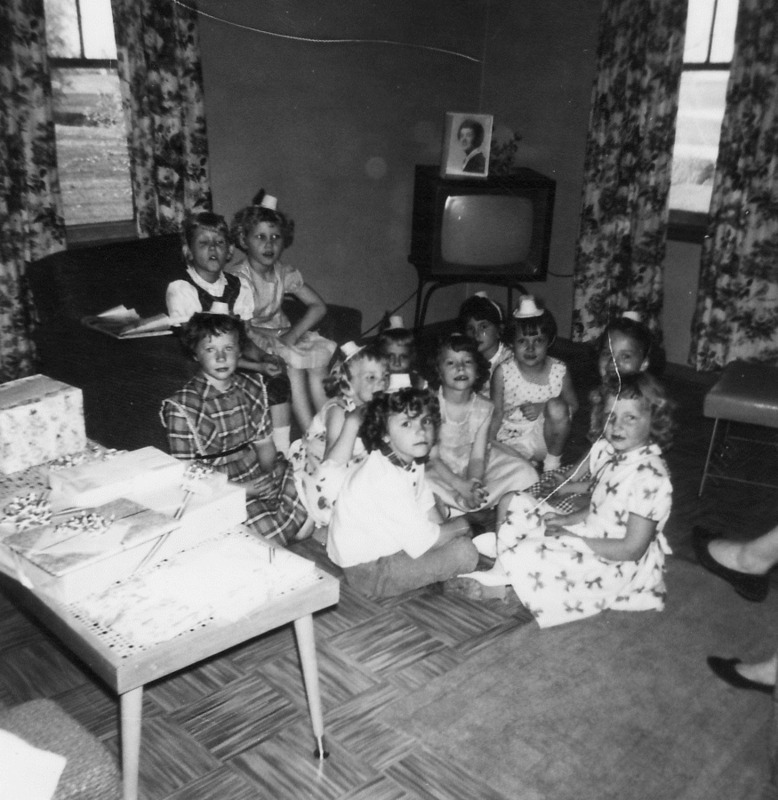 In addition to our school dresses, we had (apparently) little tiny party hats, like the kind a trick monkey would wear. Granted, there was no such thing as a party store; only the local confectionery, so my mom managed to find festive paper plates and candles and....excruciatingly puny hats. I was soon to enter first grade at haunted Lincoln School, which was seemingly erected in the Revolutionary War period, and was slated for demolition. I believe my class was the last to inhabit the building before it was mercifully "put down". It was an imposing and scary red brick building -- a long concrete staircase to clamber up to reach the Gothic barricades. I'm shocked there weren't clanky iron knockers affixed to the door's facade. Once inside, however, it was as cheery as a medieval asylum could be. My teacher, Mrs. Fisher, did her best to obscure the mammoth green chalkboard with kid-appropriate primary-colored placards and assure us that the creaking floor absolutely did not mean that the floor was about to give way beneath us. I'd had my run of showing off in kindergarten, but had since absorbed the rules of polite society, so I now kept my head down and concentrated on being a good girl. "Good girl" was the new coat I wore. It served me well for a decade. Musically, not much was shaking. I was still influenced mostly by my dad and by our wondrous TV. Any tune that was featured on a television show was a sure-fire hit because we had nothing else, really. I was still a couple years away from obtaining my very own pink transistor radio. So, I plopped on my belly in front of the big screen and absorbed anything anyone wanted to tell me, in black and white. And this movie that played out on our black-and-white. The movie was oh-so-melodramatic, and I didn't understand most of it. It did, however, star Jim Hutton (Timothy's dad) and a girl who called herself "Tuesday" and an actress who went on to become a nun (! ), and good old Paula Prentiss, who was omnipresent in every sixties movie. Another dude who had his own TV show, on ABC, was that old sausage-maker, Jimmy Dean. Jimmy's was a variety show that featured a dog (?) puppet named Rowlf, who turned out to be the patriarch of The Muppets, and who would'a thought? There were actually two classic tracks released in 1961, but I'll just keep them a secret, because I didn't know they were classics when I was six. And frankly, they didn't even register with me then. I had other stuff to do, like watching TV and skipping through the (icky) woods behind my house. I will say that I learned how to not be a snob in 1961 by observing silly girls freak out over muck on the bottom of their shoes. And I conquered my fear of decrepit buildings.